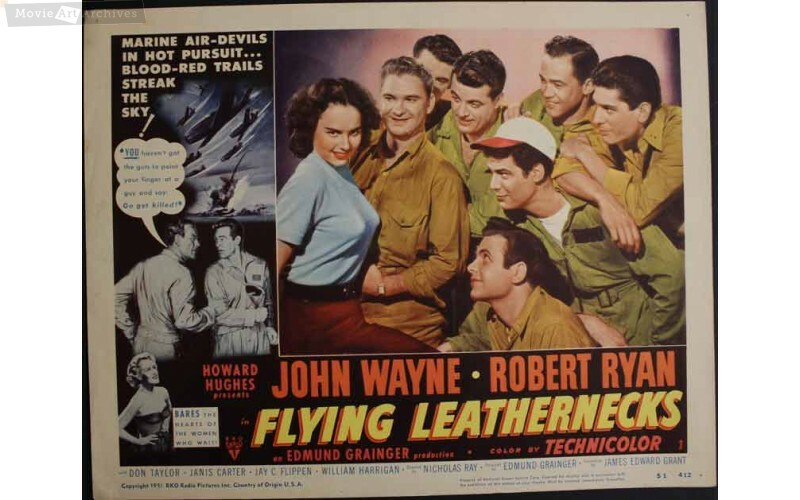 FLYING LEATHERNECKS—-war movie buffs and John Wayne fans will catch this one without reservation: others not interested in flaming ‘Zeroes’ and up’n at’em speeches will be put off fast. 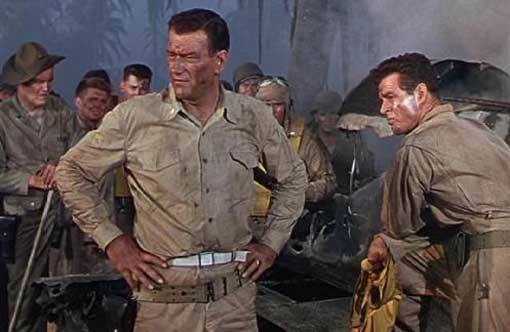 Set in the South Pacific, around Guadalcanal, in ’43, the wheezing-tired script reactivates The Dawn Patrol dilemma of the gruff commander who pushes his easy-going execs and boyish pilots to the limit–‘cuz the job’s a dirty one and someone has to do it. So, all we have to do is fight the Japanese Air Force and we get to date this…. ‘nurse’? Wayne is suitable, and Robert Ryan makes a strong co-star, but the supporting players are nondescript, and the hangar harangues are old hat. Aloft, director Nicholas Ray blends a very impressive batch of vivid color combat footage with his studio shots, making for spectacular battle scenes. Noisy, fast, and ferociously real, these action segments will keep gung-ho’ers gunging. From 1951, alternately droning or zooming by at 102 minutes, with Don Taylor, Janis Carter, Jay C. Flippen, Adam Williams and Carleton Young, it racked up $5,720,000, coming in #16 for the year. 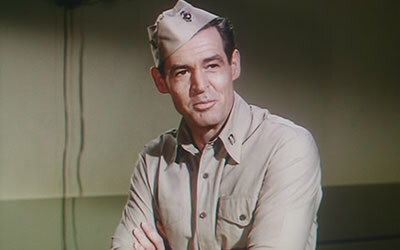 Fledgling actor Williams won the Navy Cross for heroic piloting of his dive-bomber in the Philippine Sea, 1944, and went on to a long career, mostly as a bad guy.